This page is very important. Please thoroughly follow all instructions below. Listed are the required documents you need to send to us to come on a Global Ventures Trip. We must receive your documents by the final payment deadline, or a late fee of $100 will be applied. Click here to complete an online application if you are a U.S. or Canadian resident. Click here to complete an online application if you are not a resident of the U.S. or Canada and would need to obtain a passport from another country. 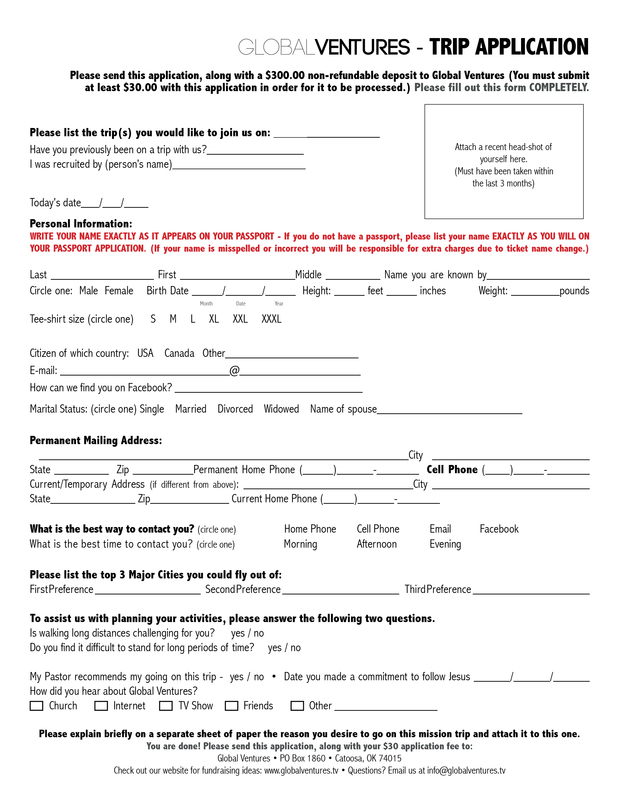 Click here if you prefer to print the application and mail it to us. Page 6 must be notarized, or your forms will not be accepted. Click here to download. This must be filled out and sent in by your Pastor. If you do not have a close relationship with your Pastor, have a church leader who knows you well complete the form. We need a color copy of your passport picture page in the event your passport is lost while in country. Please be sure that when you scan it the picture is clear and all text is legible. Some countries we travel to require visas for entry. Your Global Ventures representative will notify you if visa pictures are required for the trip that you have applied for.